We really need to hit the grocery store for supplies. Guess that means it’s time for another eggy post, eh? But what could I possibly write about scrambled eggs? You take some eggs, beat them with a fork, and stir them about in a hot skillet with some butter. Nothing to it. 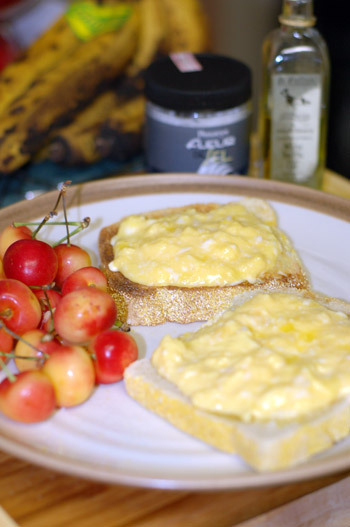 Well, there is a pretty wide range of things done with scrambled eggs all over the world, and they’re some of our favorite easy meals. I’ve already dealt with migas, the Mexican incarnation, so how about French? One of our go-to recipes for eggs is a simple slow-cooked scramble on toast. I don’t do my slow scramble quite as low and slow as French-style eggs would dictate, but they still take a good 10-15 minutes, and end up with a soft, creamy texture. If I’m in a hurry, I bump the heat up to medium at the beginning to get the eggs heating up, and as soon as they start to cook, turn it down to low or medium low again, adjusting it to keep things moving forward but not too quickly. The touch that puts them over the top is a drizzle of white truffle oil and a pinch of fleur de sel at the very end. Although there is very little butter in these eggs, the manner of cooking makes them seem far richer and more decadent than the usual scrambled eggs. In a nonstick skillet, melt the butter over medium low heat. Meanwhile, break the eggs into a small bowl, add the water, and whisk thoroughly. When the butter is melted, add the eggs and salt/pepper, and stir continually over low/med-low heat until eggs become creamy, with a consistency akin to loose oatmeal. Meanwhile, toast the bread or English muffins (or English muffin bread, as we used in this case) and spread with butter or margarine if desired. When the eggs are ready, spoon them evenly over the prepared toast. Drizzle a few drops of truffle oil over each piece of eggy toast, followed by a pinch of fleur de sel. The fleur de sel adds an intermittent salty crunch to the creamy eggs, and the truffle oil makes everything fantastically fragrant and decadent. If desired, you can combine this open-faced egg sandwich with cooked vegetables of some variety. Molly suggests leeks cooked slowly with butter and swirled with a dab of creme fraiche, a lovely combination that felt so rich I couldn’t even finish eating it. Another excellent option, and one we’ve employed many times, is the long-cooked broccoli from Nancy Silverton’s Sandwich Book , but any tender vegetable that you could imagine pairing with eggs could stand in. For dinner the other night, I decided to make an Australian breakfast. Time-wise, it probably wasn’t too far off, come to think of it. I’ve been wanting to try Bill Granger’s corn fritters for quite a while, so I made up a batch of those and a skillet full of Bill’s scrambled eggs to go with them. The main element that sets these eggs apart from your run-of-the-mill scrambled eggs is the addition of heavy cream, which makes them incredibly fluffy and tender. Whisk together eggs, cream and salt. Do not put more than two servings of eggs in one pan, or the eggs will get over-cooked. Melt butter in a non-stick skillet over medium-high heat. Pour in egg mixture and after about 20 seconds, using a spatula or wooden spoon, push the egg mixture on the outside of the pan to the center in a folding motion. Let eggs set for an additional 20 seconds, then repeat. 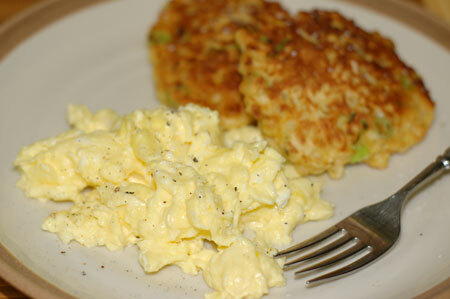 When all the eggs are just set in the center of the pan, looking soft and somewhat wet, turn them out onto a plate. Serves 1. Just for good measure, when I just don’t feel like fussing over my scrambled eggs, this is how I do it: Tablespoon of butter in a nonstick skillet, melted over medium heat. Turn the heat down to low and crack the eggs (usually 4-5 for the two of us) into the skillet, add a splash of milk, and as quickly as possible, stir it all around vigorously with a wooden spoon until moderately mixed up. Return the heat to medium and continue stirring, giving it a few seconds to set between stirs. Cook just until all the egg is barely set but still moist. This method means no extra mess in a bowl, and produces your standard fluffy scrambled eggs. I sometimes mix it up by cooking some veggies or whatnot in the butter before adding in the eggs. A favorite is kielbasa: We sometimes pick up sandwiches from a barbecue place on the walk home for lunch, but they’re too big for me to eat all at once. I save my leftovers with their accompanying sauteed onions and peppers, dice it all up, and scramble it with some eggs and cheddar cheese for another day’s lunch.